JACKSONVILLE, Fla. — The sound of kids reading, is music to the ears of man's four-legged friends! Every Wednesday, the Pawsitive Reading Program connects kids with cats and dogs. “When you read to them the dogs get attention and it makes the dogs so happy,” says Leila Talbot, a 6th grader. For the young readers, cats and dogs don't judge. “They don't care if you mess up,” tells Lily Udekwu, a 5th grader. Lily has been in the program for two years now and says reading to a dog is a lot less pressure. “I used to stammer a lot, but that has gotten a lot better,” she says. The extra reading is really paying off for the kids in school. “She probably reads on a 9th or 10th grade level and she is in the 5th grade,” tells Lily's mother, Melissa Udekwu. The program is also a chance for the animals at the Jacksonville Humane Society to interact with kids. 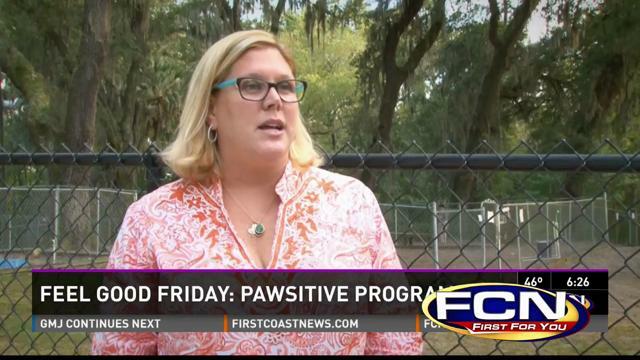 “It is really a wonderful experience for them because in a lot of cases it is very calming for them, it also provides an opportunity for them to be more comfortable in front of humans and around humans,” tells Diana Fox with the Jacksonville Humane Society. Whether it is Clifford the Big Red Dog or Harry Potter, it doesn't matter what you read. The animals are just happy to have someone near and these kids get a loyal audience.